After our trip to The Henry Ford Museum (a separate post with photos of that is a day or 2 away yet), we stopped at Greenwood Cemetery in Fowlerville, Livingston County, Michigan on the way back to show Kyle and Zoe, and their second cousin Kathy where their great great grandmother Marie Christensen is buried. Marie was married to Octave Painchaud, and their 2 children were born as Harvey and William Painchaud. But after Marie divorced Octave on the grounds of “extreme cruelty”, and had married John Chancy Thomas, she had William and Harvey’s names changed to her maiden name Christensen. If not for this Kyle, Zoe and Kathy would have the last name Painchaud. This first picture is of Lot 228 in Greenwood Cemetery where the only headstone is that of George E Thomas who was killed in action in World War II. 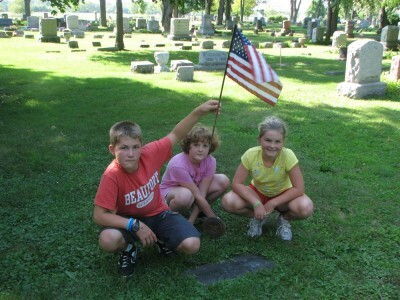 But also buried here is Marie Christensen, and her 2nd husband John Chancy Thomas and Bobbie Macigewski (a grand-daughter of Marie ) who was born premature. Kyle, Kathy and Zoe Christensen at headstone of their half great great uncle George E Thomas, who was killed in action in World War II. George's mother Marie Christensen is the great great grandmother of the 3 kids. 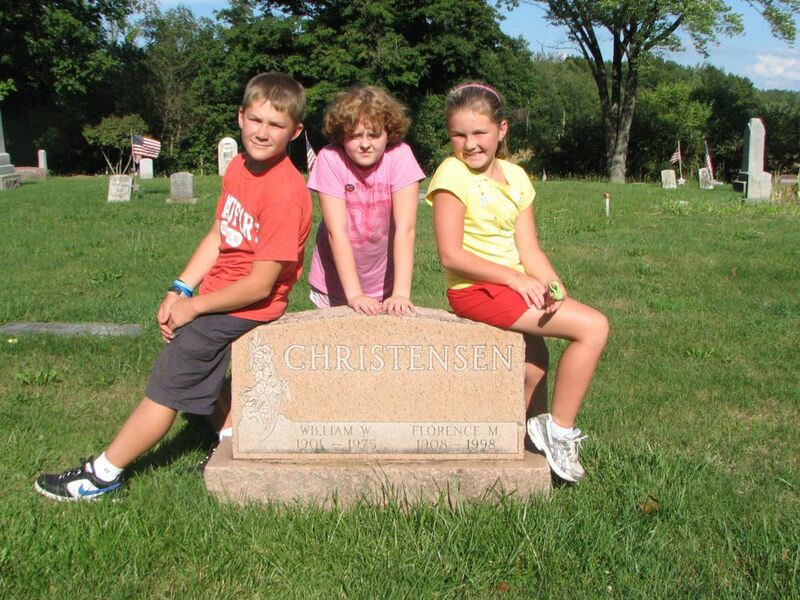 This second headstone is for Christian William Walter Christensen and his wife Florence Krumm. William is the kids’ great great uncle – brother of their great grandfather Harvey Christensen, and son of Marie Christensen mentioned above. Kyle, Kathy and Zoe Christensen at the headstone of their great great uncle William Christensen, and his wife Florence Krumm. For lucky Kathy this was her second visit to this cemetery – Lisa and I took her there at Christmas time to try and find the grave of Marie Christensen – not so easy in the snow, and with the Military marker for George E Thomas either laying over or removed during the Winter.